Pool’Gom® is specially adapted not only to clean the waterline but also all the plastic materials present in pool and spa areas. patio furniture : tables, long-chairs, etc. 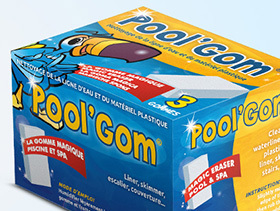 Pool’Gom® is made from a patented plastic eraser material whose surface flaunts the ability to harden when humidified. The hardened surface remains nevertheless pliable allowing for easy and efficient cleaning; even those inaccessible nooks and crannies. Without the use of detergents or chemical products, Pool’Gom* enables you to eliminate stubborn marks and stains with a simple scrub. It is particularly useful on the waterline but also adds sparkle to all the plastic items in your pool or spa area; skimmers, shutters, covers, stairs, patio furniture, etc. 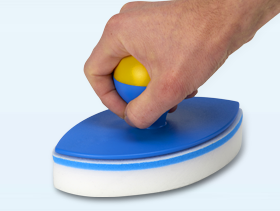 Why is the eraser Pool’Gom® so efficient? Its special patented composition is a highl-performance product adapted to cleaning the waterline as well as the other plastic items around the pool. 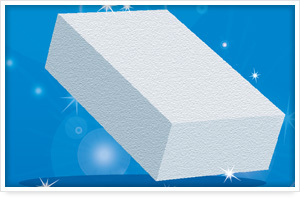 Why is it called an eraser and not a sponge? 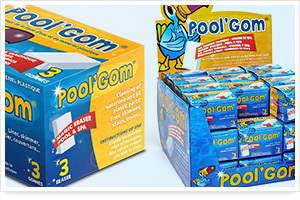 Once dampened, Pool’Gom® is used as an eraser, in other words, simply rubbing it on a surface guarantees results. You’ll notice that the Pool’Gom disintegrates like an eraser which explains its exceptional efficiency. What types of surfaces can Pool’Gom® be used on ? 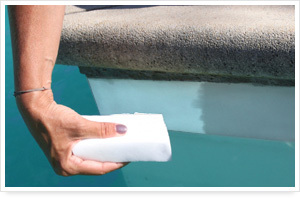 All the surfaces in and around your pool area: liners, tiles, fiberglass, stairs, shutters, covers, plastic patio furniture, etc. However, Pool’Gom® is an abrasive product so for varnished or delicate surfaces, we suggest doing a spot test on a hidden area beforehand – don’t use it on the finish of your car for example. 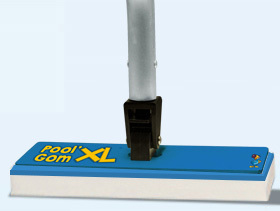 How long does a Pool’Gom® eraser last? Pool’Gom® disintegrates according to the extent it is used, the porosity of the surface it is used on and the amount of grime build-up. Once you’ve tried Pool’Gom®, you’ll be hooked. Its easy use and exceptional results make it an indispensable tool in the world of pools. 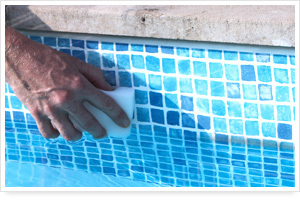 Pool’Gom® is not a sponge but truly an eraser and it should be used as one; in other words, simply rub out any marks or stains on the areas to be cleaned. Dampen the tip of the eraser and rub the surface to be cleaned. Not to be used on varnished or fragile surfaces. In case of doubt, do a spot test on a hidden area.